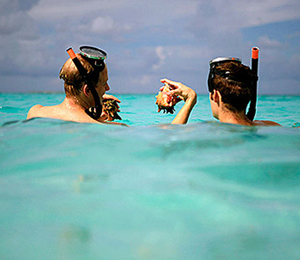 This amazing tour takes you on a sightseeing tour and a snorkeling adventure. Guests ride out of the Nassau Harbor aboard a new 72-foot double-deck catamaran. You will get a narrated history and guided tour of many of the important historical sites that surround Nassau. Once this scenic trip is over, guests get to jump in the beautiful clear-blue waters that the Bahamas are famous for and begin their own snorkel adventures. The waters of the Bahamas are the clearest in the world, so guests will be sure to spot a wonderful array of exotic plant and animal wildlife. After snorkeling, the boat travels to the remote Athol Island where you can jump in the waters, lie out in the sun, play in the sand, or do whatever you want! All snorkeling gear is provided, making your trip that much easier for you! You also don't have to worry about bringing food, as the tour provides guests with a delicious Bahamas-style lunch with BBQ chicken and Bahamian-style peas and rice. Soft drinks and water is also available as a complimentary gift for our guests. What is included in the lunch provided? The lunch consists of BBQ Chicken, Corn On The Cob and Bahamian Peas & Rice. What beach does this tour go to? We take you to the beach with the best conditions and least people. Oftentimes we get to go to Rose Island, but if the conditions are better on a different island, we will go there. With all the media hype it's understandable why people often ask this question, but the truth is that unprovoked shark attacks are very very rare and attacks on snorkelers are even more rare. Our staff are all trained in making sure your trip is safe and enjoyable. Is there a charge to pay the balance with a credit card? No, no additional fee will be charged for paying your balance with a card. I have been to the Bahamas many times, but Bahamas Ocean Snorkel is one of my favorite trips! It includes everything that everyone should do here. As a Bahamas veteran, I can say only the best about this experience!